What a location! Plum on the beach at Porthmeor, St Ives, Blue Waters has been flawlessly created for the ultimate luxury beachside holiday. Soak up the ever changing coastal views from sunrise to sunset, high tide to low tide and immerse yourself in the wonderful sense of light and space. Blue Waters offers 3 boutique bedrooms each with its own unique design twist and presented with luxury in mind. The open plan living, dining and kitchen space invites families and friends to come together whatever the occasion and whatever the season. A cinema room is located within the basement with doors opening onto the beach! Follow the picture perfect streets of St Ives, past the harbour and through the historic downalong area to the stunning Porthmeor Beach, your holiday starts here! Blue Waters is set over 3 floors and has been professionally interior designed to showcase a pure, scaled back Scandinavian style oozing simplicity and understated elegance. The jaw dropping coastal scenes are captured at every opportunity, sit back and soak up the oh so blue view! Arrive into the open plan living, dining and kitchen space which welcomes the coastal holiday ambiance. The modern kitchen has all you could need for your beside the sea menus whilst the laid back dining area encourages the group to gather, eat, drink and chat. Relax in the comfortable sofas and watch the comings and goings of the beach life below. The beach basement level offers an oasis of calm with ample seating and an impressive cinema style TV for those cosy movie nights. Open the doors from this lower level and step out onto the sands, what could be better! A convenient shower room completes this floor offering a warm and welcome hose down post surf. The bedrooms are set on the upper 2 floors with generous master bedroom at the top of the house. All of the bedrooms are ensuite and have been dressed to impress. Slide back the glass doors to your private balcony overlooking the sea and gaze down upon beach life and the golden sands of Porthmeor, St Ives. The basement level offers direct beach access! Whether you are new to the area or it has long been a family favourite, create your base at Blue Waters and dip in and out of life beside the sea. The beach is quite literally a hop and skip away where children can run free, dive into the surf and rockpool to their hearts content. Choose to stroll down to the harbour front and enjoy the comings and goings of the local fishing boats or head to any of the golden sand beaches all within walking distance. A collection of artisan cafes and coffee shops are scattered throughout the quieter Downalong area, guests will enjoy the luxury of the holiday base where popping out for a coffee or peaceful stroll becomes and easy option. There is also a small kitchenette within the basement level which includes a microwave, fridge and sink. This basement level offers direct access onto the beach! Double doors directly onto the beach! Please note due to the sand shifting throughout the seasons, access to the beach may be restricted. If this is the case then further beach access within 300 yds! There is a steep slope leading down under the archway to the courtyrad. There are approx 10 steps with handrail climbing up to the front door. Level access to the balcony from the living space. Blue Waters is set over 4 floors.Please note that the staircase leading to the basement is open plan from the kitchen area. There are 3 internal flights of stairs. The top floor loft conversion/en suite bedroom is open plan to the stairwell and doesn't have a door. This is a Cornish Gems serviced property. The property changeovers, welcome gift and maintenance are managed in-house by the Cornish Gems team. 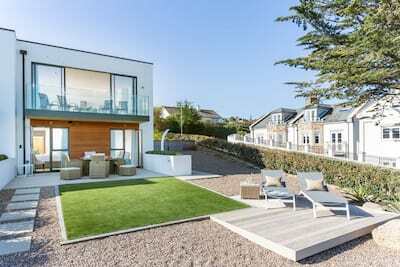 "For a coastal stay in Cornwall, the luxury holiday letting company Cornish Gems has added a brace of properties. We love Blue Waters in St Ives - reached via the beach house/cinema room." "You can't get much closer to the sand than this stylish, three-storey apartment [Blue Waters]. 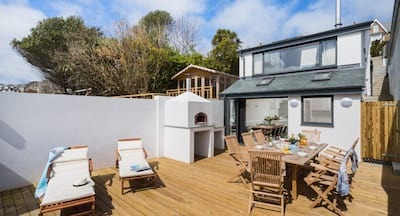 Step on to the surf beach Porthmeor through the French doors in the downstairs snug, which has a cinema-style TV and comfy sofa."